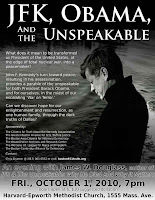 Boston/Cambridge Alliance is one of several local groups co-sponsoring a local stop by theologian and activist James Douglass, author of JFK and the Unspeakable: Why He Died and Why It Matters (2008). Douglass is on a six-city tour of New England and Philadelphia marking the paperback release of the book. The Cambridge event takes place at the Harvard Epworth Church, 1555 Mass. 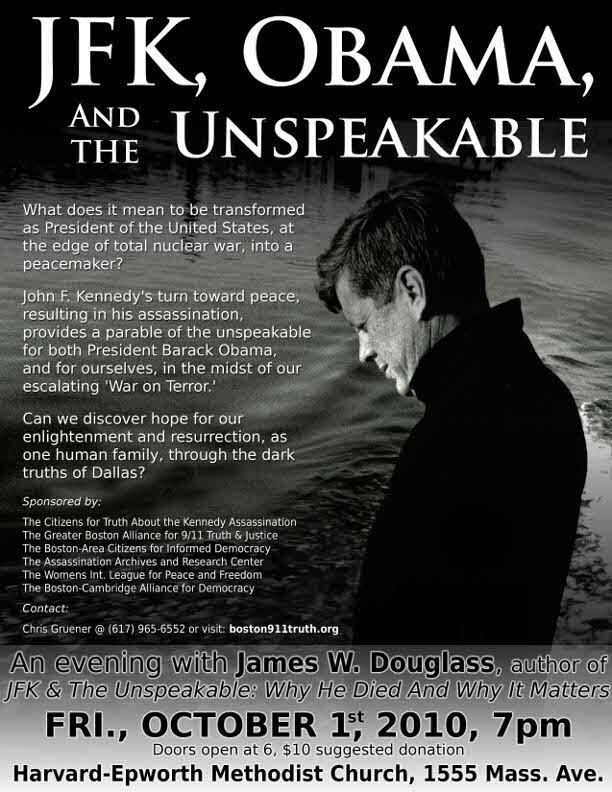 Ave., right outside Harvard Square, beginning at 7 p.m.
From the release: "James presents motive and circumstantial evidence aplenty, all excellently and extensively documented, that the CIA and the Pentagon were the primary interest groups and executioners of JFK, the president who turned from cold warrior to peacemaker. Other heavy industrial interests are implicated as well. The same interest groups that executed this 1963 coup have formed the 'deep politics' 'shadow government' ever since, attacked the US on 9/11, and hold the US and the world hostage to this day." For venues and co-sponsors, dates and contact info, click the "read more" link. Peace Studies Program at Central Conn. State Univ.